This 130-page e-book is packed with clear-cut instructions and terrific resource materials that will make creating a loan application package easy. It even includes a sample loan package that you can use as a model. This e-book is a must-read for business owners interested in financing options, or accountants that will be in a position to give financial advice. In addition, you will learn the inside scoop on how the financing industry evaluates the loan application, and tips that will put your application on top. The e-book comes with a zip file containing 11 helpful forms in developing a loan application form. Just load the file into any word processing program and you're ready to go. 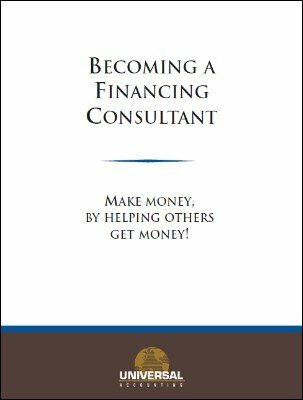 This e-book is a must-read for business owners interested in financing options, or accountant that will be in a position to give financial advice. We also include instructions in how you can even promote your service and earn $50 to $75 per hour on a part-time basis.